Have you been injured or had surgery such that you are required to consume something for pain? Well, my past surgeries and injuries didn't have me needing pain meds until my bike crash two weekends ago. Those of you that have been prescribed pain meds....do you notice that EVERYONE asks you what you are taking? Is this because I've suddenly become part of their club I'm racing to avoid (at my own pain threshold), OR is it because they want what is leftover and deciding if they will ask? Next time you are required to take pain meds...just watch how many people are drug curious around you. BTW, I'm completely off my Codene/Tylenol and the remaining three tablets will become part of my first aid kit. So I've been using my magnetic therapy 30 minutes daily, and I can tell I'm healing fast (should allow me to heal in 4 weeks!). Had to get on the trainer yesterday...wow I LOVE the endorphin drug much better than Codeine. While I was spinning, I SO wanted to go hard...then my Ribs reminded me of their damage and I suddenly found the limits of my breathing. Ok...I'll go slow, for a little while. 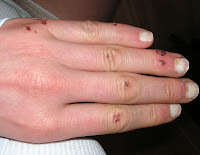 My friend Davy asked what I was doing this weekend, and chuckled about "pickin' scabs." Well...I don't need to do it...because the are falling off all over the place. Oh, and I just received my new FSA compact carbon handelbars to replace those I destroyed in Sequim. YES! I've been living with some wicked pain over the last 10 days. Pain is an interesting thing in the body. The pain I've experienced is nearly the worst I've encountered in my life (physically of course), yet I'm not sure I can say so. 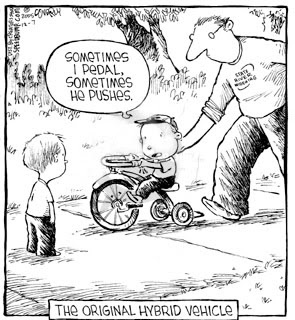 Because we can't recall pain, we only recall our experience in it. I also know that distraction helps me avoid feeling pain; like pushing through pain during a race. There is also pain of loss right now in that I'm extremely limited on what I can do...yet finding new things I can do (or didn't do previously) is a great distraction to my pain. Needless to say...when I lay myself down at night, there are no distraction to my shoulder, bruised/fractured ribs and cranky collar bone; thus I make blog entry at 6am. Good Morning. So I'm going to my orthopedic doc today for some new pictures. We are also investigating if I'm a candidate for ultrasonic therapy that accelerates bone healing. Its pretty interesting and is said to advance healing by 20%. Typically these are fungible by insurance companies if the fracture is compound (open), not healing, or in a difficult location for stabilization (this is where we hope I qualify). You can check out the technology here. Also, I received my new bike (single speed) this week; although too drugged to appreciate it, I post it here as further enticement to faster/accelerated healing. Today I also turned another corner as I can now move my left arm away from my body without pain. It will be some time before it can move up (to touch the sky). This means I can type with two hands! 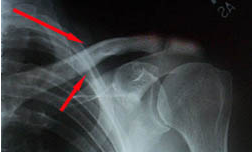 This is the xray of MY collarbone AFTER being tossed from my bike. OUCH...its a little wacked out and probably poked a few things around it. No wonder my entire chest is black, blue and a little green now. Oh...I found a fascinating account of the accident from another woman on the Starbuck team. You can read it here. Wow, pain is a workout! I can be vertical for a couple hours at a time...before I need to "reset" my bone from the pain and discomfort. 1) A business associate sends me a personalized watercolor painted dove - "get well." My recent crash and fractured left clavicle had me thinking. Why do I always roll such that I land on my left side instinctively? I began to scan articles & photos of Velonews and pro-cycling to notice the way cyclists crash or position their bodies when they sense impact is eminent. I recall that all major falls have me taking it in the shoulder or upper ribs. I've bruised my shoulder, fractured ribs mountain biking, bruised ribs skiing, and yes fractured my collar bone jumping off a bmx ramp...EVERY TIME on the LEFT side. I told my very intuitive and special doctor friend from Canyon Ranch. She said, "Well, Lisa...that is your feminine side. What that side represents in our emotion, intuition, feeling versus logic and intellect of the right side." We noodled on it a little further and talked about the use of our shoulders and clavicle in life as a place we carry weight and lift items above our heads. Hmmmm. I suspect there is some lessons here to learn...as either I consciously feel that my left (feminine) side can take it, or I'm willing to beat that side up first (read more about body balance here). This is likely a unique growing edge, yeah...a growing edge. Here are some images of my helmet (kids pay attention here). I clearly smacked this down hard and don't remember any hang time during my crash; Just the smack into the woman fallen before me, then SMACK hard on the pavement (catapult). 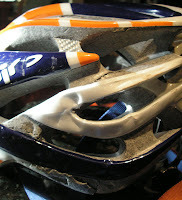 This was the Giro Atomos Helmet in Rabobank (or Byrne) colors and it performed as it should have, BRILLIANT. I'm buying another one (as this one is toast). My bike...well. The Cervelo P3 survived. The FSA bars are toast and the Dura Ace Hoods look like some teenager took a 22 rifle and shot a round into them. 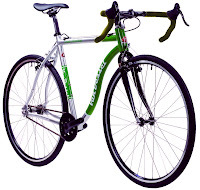 My wheels will need to go back to Topolino for truing and, yes, well...some new ceramic bearings (can't help myself). 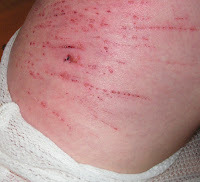 Lots of road rash...including this section on my upper thigh and entire leg. 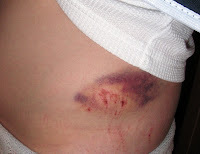 Bruises that are everywhere and are just beginning to develop...some rather unique and deep colors. 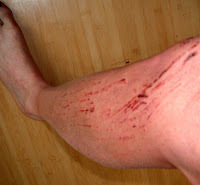 My leg actually had some deep ones mostly at the knee. My left thumb was not too fortunate. The road or my bike grab a slice of skin off (I'm saving my audience here). I also have some infection starting here...so doc put me on antibiotics. Yeah. This is the top of my left pelvis (hip) as I clearly landed on my 1) head, 2) shoulder and 3) hip, then rolling for all the extra juicy road rash. Looking at my clothing...I clearly benefited from the three layers of tops (undershirt, jersey and breezewall vest). The vest is destroyed, jersey slightly and undershirt barely. 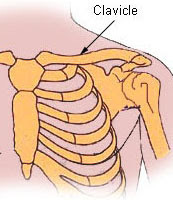 My shoulder and its collar bone are where my pain resides. My scapula and upper ribs are bruised (can you say its fun to breath). Here you see my neck and the bruise exposed at the surface (had to keep this rated G). Well...I'm off to heal. 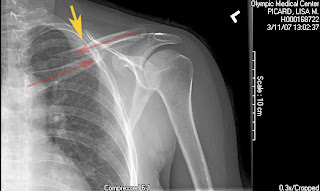 do you know the clavicle? i broke this bone when i was 15 years old. they say its the most painful because all of the nerves and the in ability to stabilize when broke. it took me 2 weeks before my mom could drag me to the doctor. well sunday bike racing in sequim, a woman in front of me opted to lay down her bike and it catapulted me into the chip seal, sand paper road at 18mph. I have a severely fractured collar bone, Large bump on head (shattered helmet), Chip seal imbedded along my left side, Bruised hip and ribs. I’m blessed and shall live to fight another day. Fellow riders got me home after the hospital. Christina, a teammate stayed with me all night and today helping me through pain cave and dressing wounds, bath, dressing, etc. people are amazing. 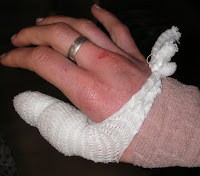 Typed with one hand of which is bandaged.